Notre Dame prepares for a deep tourney run with an opening round sectional contest against SOC I foe New Boston. In a matchup that pits one guard-heavy lineup versus the next, Wheelersburg (18-4) takes on Adena (6-15) Thursday night at Valley. The Pirates bring leading scorers Abbie Kallner and Kaylee Darnell to the table while their teammates Ellie Kallner, Alaina Keeney and Ellie Kallner are playing a high level as well. Wheelersburg ended the year at 13-1 inside SOC II play and that’s saying something considering the level of competition the league boasts. The Warriors will have their hands full trying to stop that bunch. Leading the charge will be junior Hannah Stark, an all-conference player as well assists Jayden Smith and Abby French. Adena does have two wins this season over SOC II foes … a 56-51 win over Valley on Jan. 19 and a 71-52 decision over West on Feb. 5. Having said that, Wheelersburg also beat both of those programs twice, handily, this season. With an impending date with either Huntington or Fairfield, the Pirates will use their speed in transition and rely on their defensive instincts to try and top the Warriors. Here we are, the top seeded Notre Dame Titans begin their quest on a second consecutive district title, and if Titans fans and players have their way, an even deeper run. This sectional final matchup pits two SOC I foes against each other in the Tigers and the Titans. In their previous two matchups this year, Notre Dame stole each of the two games by an average margin of 27.5 points per game, the most recent being a 52-29 decision on the Tigers home court just ten days ago on February 4th. 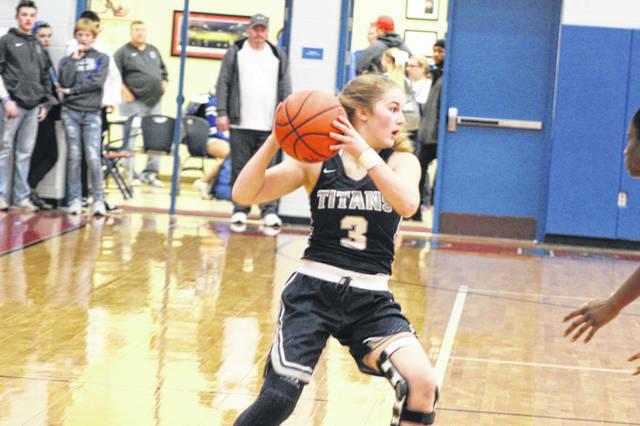 If New Boston wishes to knock off the fifth best team in the state in Division IV in Notre Dame, they’ll have to rely on their high-pressure defense to force the Titans into turnovers on the offensive end, and they’ll need to connect on a high number of their three’s. For Notre Dame to come out a winner, the Titans will need to stick to their game plan, just as they have in their first 22 games of the season: incredibly physical defense, crisp and precise passing, and using their depth to their advantage.